A delicate Greek key design adorns this black & palladium hinged bangle. Measuring 6mm wide it is easy to match and the perfect accessory for any occasion, either as a single item or stacked with other bangles. 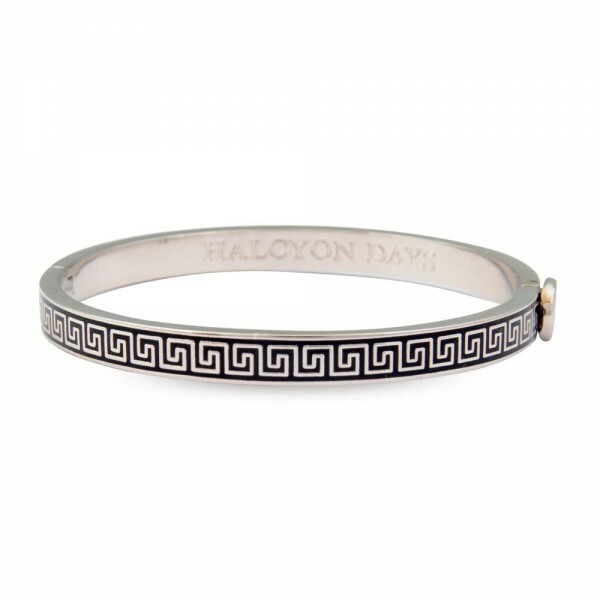 The bangle is finished in palladium plate and features the Halcyon Days branding on the inside. It is available in a selection of vibrant and classic colours. Each bangle comes individually packaged in a signature Halcyon Days box and pouch for perfect gifting and storage. Halcyon Days has an established relationship with The Royal Household and has the prestigious honor of holding all three royal warrants as supplier of objets d'art.